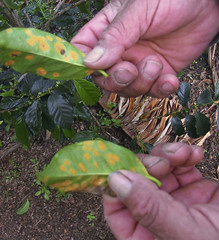 In this weeks in my mug I talked about Leaf rust (roya) and the problems its causing on Colombia at the moment. 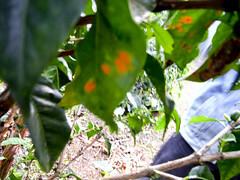 Leaf rust (roya) is a disease that effects the leaves and the yield of as coffee plant and its general health. Firstly found in 1869 in Ceylon (now known as sri lanka). Ceylon was a huge coffee producer at the time, but because of the rust they ripped most of their coffee plant stock, and planted tea. Kind of good for them as they became one of the tea producing giants, but this was not the end of the disease. From Ceylon the next place for rust to be cited is in the 1870, where it spread to sumatra and Java and the Indonesian isles. This was devastating and saw a change of varietals that were planted as a way of combating the problem. From Asia the next place this was to Tanzania and Madagascar in the 1880’s. Interestingly not making it to west africa until 1956 which seems very strange to go from this rampant spread to stop spreading (but still having a very strong foothold in the places where its found). It seemed that South / central America was immune from this spread, but then in 1970 it was reported in Brazil and from there rapidly to all south / central American producing countries. It is transported by a powder that is attached to the plant (like pollen) and is carried through the air, on clothes by people and by insects, and once it begins to take hold then it really does go rampant. A lot of effort was put into finding a coffee that was naturally immune from the disease, and it was found that strains like Liberica and robusta have a higher resistance to the roya but arabica is very very susceptible to it is weak against rust. Lots of cross breading has produced some more immune strains, but normally at the cost of cup quality. It is believed that high shade very wet high humidity conditions also add to the risk of roya. Talking to a friend who has just returned from Colombia roya seems to be rampant, and there is a real problem they are trying to deal with. You can spray the plants with a copper based fungicides but no one likes spraying things and these fungicides are expensive and in short supply. The other way is to plant varietals that are less susceptible. There are many alternatives but advice given to farmers in an article I was sent was to plant Catimore, which as part of a mixed plant stock is fine (and we have seen some great ones) but on its own rarely produces quality coffee. I think there will be a real drop in quality of Colombian coffee with this kind of advice, and I do hope that farmers choose a different route, the new Colombian we have just stocked is trying F6 which has more promise of quality.